Quiet: The JUKI MO-735 is highly praised by users for its noiseless operation. Durable: The machine is made of high-quality materials, thus ensuring it will stand up and still perform well over time. Fast: This serger performs at a maximum speed of up to 1,500 stitches per minute, a rate much faster than many other sergers on the market. 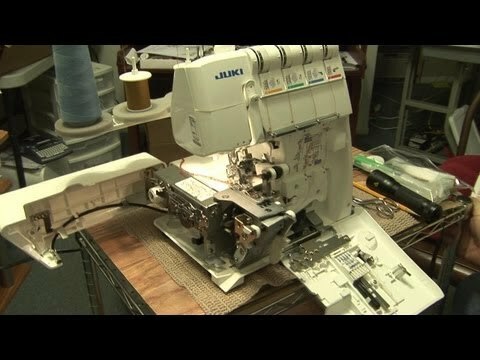 Comes with Instructional Video: The video included with the serger details how to operate the machine and also covers tips and hints to help with a variety of projects. Timely: Switching from one sewing mode to another may take a bit of time. The Juki MO-735 offers advanced stitching features that allow users to achieve the latest, most sophisticated styles. It is a durable machine that can handle a variety of fabrics from light and thin to dense and heavy. The Juki MO-735 features a number of stitch styles for expanding sewing capabilities. These include overstitching, chain stitching and safety stitching. In total the MO-735 comes with 24 stitch options for sewing nearly any type of decorative stitch with creative serging tactics. The serger’s abilities allow users to create professional-quality apparel for sportswear, formal attire, performance costumes and children’s clothing. The Juki MO-735 can handle many types of materials including lightweight as well as dense, in addition to difficult-to-feed materials. Lay-in threading: The lay-in threading system allows for quick and easy threading. The system is numbered and color-coded to take the guesswork out of the initial setup phase. Automatic looper threading: Users simply place each thread into its respective slot and put the looper in place. This process also makes the total threading process much simpler. The presser foot lifter is situated to provide users with additional clearance below the machine. This clearance allows the user to work with thick fabrics, or multiple layers of fabric, without hassle. The foot pressure dial must be adjusted according to the fabric, and the lifter is sized at 6 millimeters. The multi-function presser foot allows users to create overlock stitches in addition to adding ribbon, tape, elastic and other unique materials. The presser foot snaps on and can be changed from one mode to another, maximizing the machine’s and the user’s potential. The Juki MO-735 features safety switches on the front and side of the unit. The switches prevent the serger from operating when the covers are open. This feature offers additional user safety when completing tricky or cumbersome tasks. The machine’s lower knife adjusts with the turn of a dial. The position of the lower knife determines the width of the seam. Turning the dial to the preferred location allows the machine to cut material to the user’s specific preferences. This process works to achieve ideal seams and rolled edges. The knife helps ensure smooth and consistent cutting of fabrics of all textures and thicknesses. The reliable knife system safely and efficiently trims edges to give garments a professional finish. The knife system moves at the same speed as the needles to maintain proper cutting. Click Here to See Juki MO-735 Serger Pricing, Pictures and Reviews on Amazon! Most buyers that report on this machine state that it is reliable and lives up to expectations. The serger is also fast with powerful performance on numerous materials. The quiet machine is also versatile, providing great functionality with many helpful features.